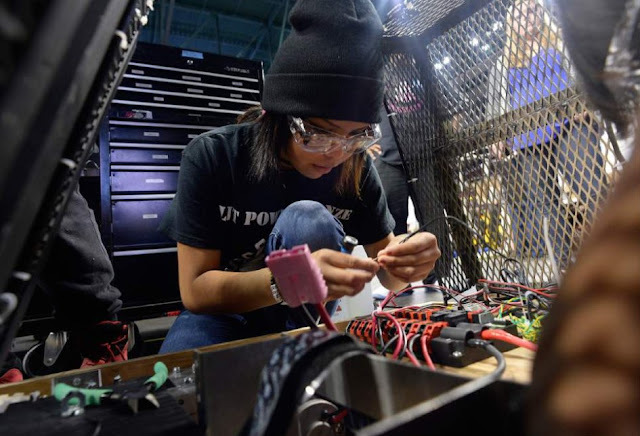 The competition draws dozens of teams from all over the Western U.S. and British Columbia - the University of Utah's School of Engineering's regional robotics competition. But this year's event featured a team that beat the odds just to be there — a team that some have likened to the Jamaican bobsled team at the Olympics. Students from Navajo Mountain High School, believed to be the most remote school in the continental U.S., fielded a team comprised of nearly half of their student body — just 32. Many of them don't have electricity or even running water in their homes, but in this endeavor found themselves creating what could be the technology of the future. "Don't be afraid!" 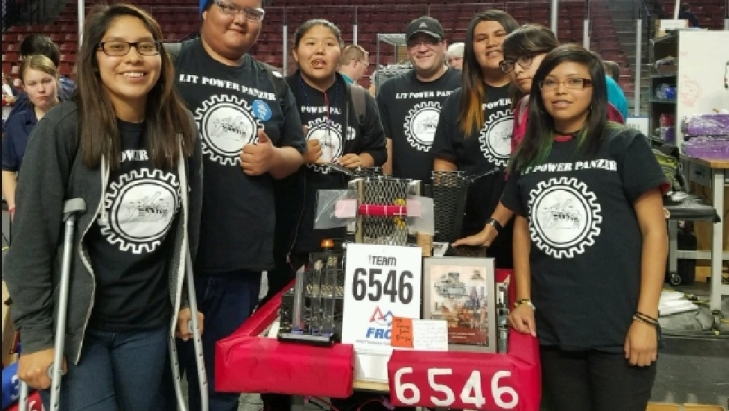 Adviser Daniel Conrad coached his team as they competed in multiple rounds in what's called a "First Robotics Competition". It was a first for this school. "They're proof that you don't need all this fancy stuff to make things happen - you just have to be determined and motivated - and they have that." "It gives me something new to learn," senior Fredale Burns told 2News he believes his elders and others in the community are proud of what they're doing. "I also hope it inspires others in our community to think about the possibility of a career in robotics or engineering." He is the driver for his team's robot when it goes up against others performing various tasks as a part of this competition. "For me, it's not really that hard. It all wouldn't be possible without our programmer. She is the one that helps me, to map out the buttons and what to do on the controller." His programmer, he says, lives far away from the school and makes the journey to and from everyday to be a part of this. Fredale says while they've learned about how to create and program and control a robot, there are also other important life lessons learned. "Teamwork and sportsmanship and helping each other, being cooperative." Mr. Conrad, as he's called, is new to this sort of thing and was challenged last year by a school from Australia. "They were trying to engage schools in rural Australia when it came to robotics and after being challenged by a university in Sydney, they essentially then came to America's Outback and found us - a very rural school with limited resources - and we decided to jump right in." He and his team have been mentored by other more seasoned teams in the competition like James Harris from Waterford school in Sandy, which was in neighboring booth to Navajo Mountain this weekend. "They don't look at where they grow up as a disadvantage. They don't look at it as adversity," Mr. Conrad told 2News, "These are talented, smart, capable kids who you give them something to make with their hands and they'll make miracles happen. And that's just what they did." Navajo Mountain High placed 35 out of 48 schools, which Mr. Conrad said was really exceptional for a rookie team. They were also given "Most Inspirational" honors and accepted the award to the applause of their peers. The team was invited to compete in a competition in Idaho, but say they will have to try and raise funding first. 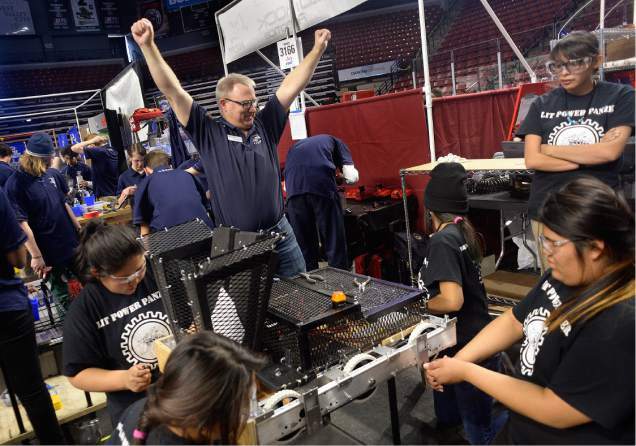 They plan to come back next year and the year after that and hope to take their robot made from scrap metal and borrowed parts to others in the reservation, Mr. Conrad says to inspire them to dream bigger. Responses to "Navajo Mountain High School competes in national robotics competition, wins 'Most Inspirational'"